May 2018 has seen another MinD secondment in the UK. The University of Wolverhampton and Nottinghamshire Healthcare NHS Foundation Trust, UK, jointly hosted visiting researchers from Germany, Luxembourg, The Netherlands, Spain and Russia to work on the two MinD design ideas. During the two weeks, the designers and psychologist worked in two teams on design development of the ‘Good Life Kit’ and the ‘We Connect – Social Engagment Map’. The Social Engagement Map aims to support people with dementia to stay socially connected and engaged, and in control of their social life. The Good Life Kit aims to support people with dementia in managing everyday life confidently. The design concepts had been selected in October 2017 from a shortlist with the help of people with dementia, caregivers and healthcare experts in Germany, Spain and the UK. 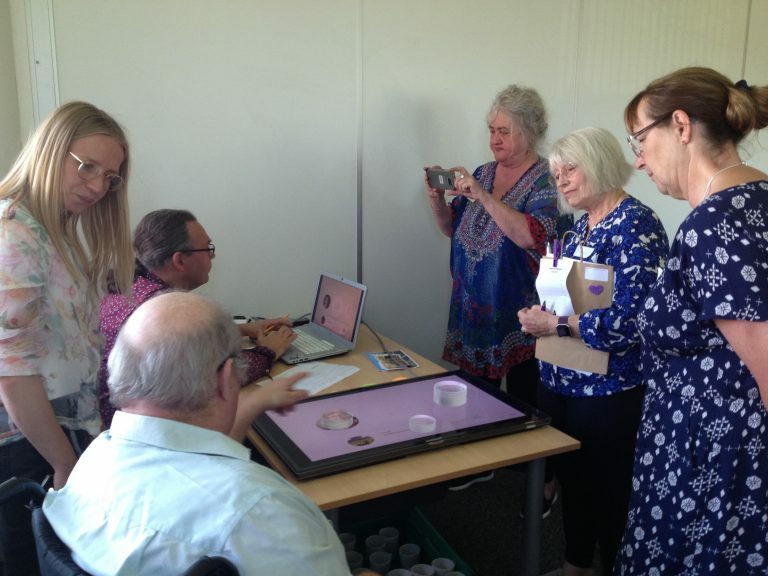 To ensure that the designs meet the needs and expectations of people with dementia, once again, a shared co-design session was held with people with dementia and carers from the Nottinghamshire Public and Patient Involvement Group (PPI). The workshop on May 14th brought 16 people with lived experience together with the psychologist, designers and programmers, to explore the functions and aesthetics of the screen technology of the Social Engagement Map from a user perspective. The morning began with coffee in a sociable outdoor cafe to allow everyone to meet and re-acquainted themselves with one another and welcome new participants. Moving indoors, a number of inclusive exercises allowed to people to connect through shared life experience and common interests, enriched by those experiences. The afternoon offered an opportunity to test out a replica of the screen, which enabled participants to comment on ease of use, aesthetics and suggestions for improvement. Users were delighted when they were able to identify their own faces and interests floating across the screen and imagine how this would enable future potential connections and shared activities. Many useful comments and suggestions were recorded through a brief questionnaire that demonstrated a vibrant interface between the technology and its PPI testers. As with the previous PPI event in March, there was a good balance between purpose and process that enabled both the project and all its participants to grow in capacity and confidence and create dementia friendly technology together within a positive, mindful and empowered partnership centered on authentic lived experience.